Such a fine amulet. Striking, really. And nicely photographed, too. I do adore peeling pain. That’s supposed to be paint. Peeling paint. Sigh. thanks for visting Jeannne, I like the idea of peeling pain hehe! that old weathered bathroom wall is a treasure, we love this old lady of a house! I love the idea of peeling pain too! Very evocative…. sorry to hear about your cat! hope it’s nothing serious. Bowie’s departure feels bigger than a mere mortal’s passing, somehow… I wonder why? but what I wanted to say was this: sometimes just reading the list of materials is pure heaven. the specificity. the sound. And then the object itself — aaaahhh. Oh my. An elder, then. My cat growing up lived to 20 but I don’t think that’s very common. Cindy. She was pure white. She died when I was in Dublin and came to me in a dream two days before I got the letter saying she was gone. my first cat Kushka (she looked like a Russian Blue) was put down after scratching one of my younger brothers severely (he did ask for it) over 50 years ago, her spirit is still with me all the way over here on the other side of the world! Ariel is looking good but has the occasional stomach problem due to some early surgeries for eating ridiculous things too enthusiastically, the first op was to remove a small rubber ball from his intestinal tract then a few months later he ate a third of a corn cob (think of corn cob pipes and how corn cobs stay in the compost heap for ears without breaking down…! Sounds like Finns chewing adventures! the vet was going to install a zipper after that second op! thanks Carol, we will all feel a lot happier when he gets his appetite back! Wish i could send you some of Venus’s appetite……..she can eat day and night………..
Ariel P. Cat – the “P” is for piggy because he really loves food and weighs well over 6 kgs, he has to be quite sick to not be interested in eating! You have so much healing magic in your hands Mo……maybe it is time for Ariel to have his own special amulet. Healing purrs coming your way Ariel from Eli Kat & the Kits…..
We had a 41C day yesterday…cats not interested in eating at all…only had a snack at 11pm. Fingers x’d it is only the heat. I’m hoping that Ariel is recovering well. 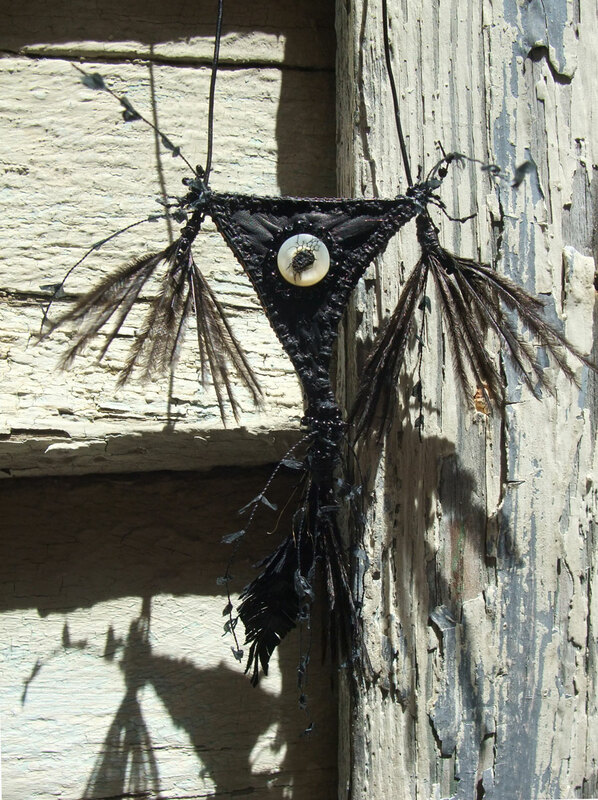 Your amulet is spitting energy…sort of humorously, to my eye. It makes me smile. 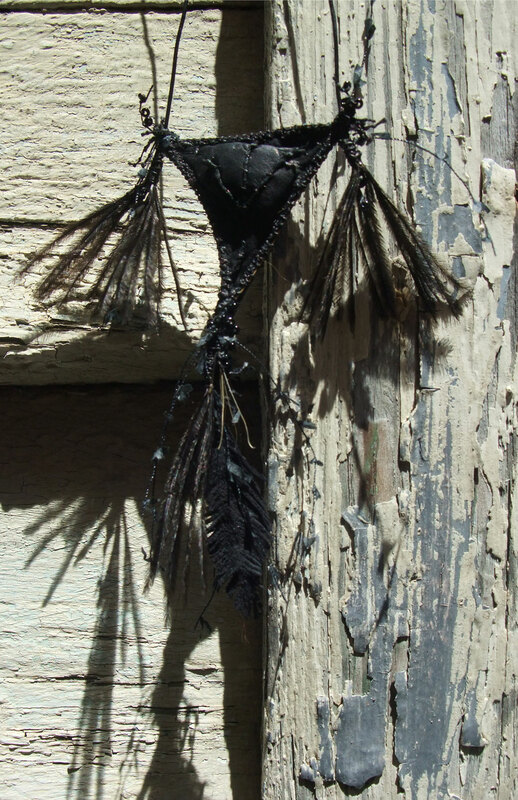 Ariel is feeling much better & thanks Dana this amulet is a lively little one with a wry sense of humour, am loving making leather feathers! The feathers & their shadows are quite striking. More magic dripping from your fingers Mo . . . and perhaps it’s hung there long enough to have a curative effect on Ariel. I adore Brugmansia and wish I could grow it here . . . I have 95% sand and salt winds. I guess not being able to grow many of the plants I love and salty windows is a very small price to pay for the sound of surf at night. it’s worth trying if you have a protected nook near a wall, looked after a fabulous specimen apricot Brugmansia when I worked at the Sydney Botanic Gardens growing right on the edge of the harbour facing North East so it copped the sea breeze (which can be strong) but not the Southerly Busters. They are tough plants but need a lot of water with some wind protection as their leaves are so big & tender and can get damaged easily & Hydrangeas grow surprisingly well right on the coast, am not familiar with growing conditions in NZ but would imagine it would be cooler and windier than Sydney? A lot cooler Mo, not many frosts on the coast and up to 28C on a hot day in summer. Her were I am the winds come straight off the Tasman, laden with salt. Nothing with a tender leaf can survive without protection and I only provide water to the vegetables which have the most sheltered spot in the garden . . . the new and small struggling grape vine is an exception. Despite having wind cloth over it, the grape may not make it as every gale sets it back with it’s leaves crisping around the edges. There’s a bougainvillea down the road so I may replace the grape with one if it doesn’t produce in the next year or two. One thing that grows really well is my childhood favourite lion’s tail (Leonotis leonurus . . . I had to look it up.) but I want a vine. ah, have heard the west coast of NZ has some wild winds sounds like the west coast of Tasmania, a bit brutal! Bougainvillea is a good tough thing and would do well, ditto the Aussie native Hibbertia scandens if you like yellow, Pyrostegia venusta aka dunny cover might do it, we have it planted on a rooftop garden here at Bronte and it has done well (needs water to cope with the wind & it may be too cold where you are (worth a try though) and you may well be able to grow blue Tibetan poppies! what a beautiful wild place!